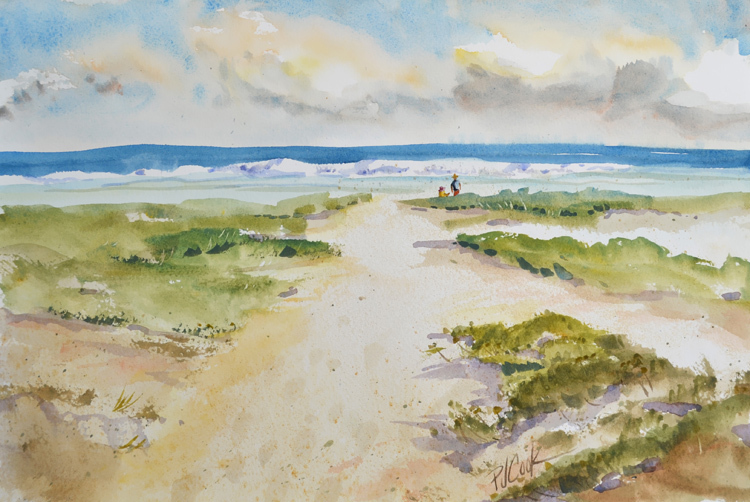 “Path to the Beach” watercolor, ©2015 PJ Cook. This original watercolor is full of shoreline texture, from the sand and grass to the water and the clouds. The path to the beach is through the sand dunes with a variety of dune grasses. The sand has many textures as it varies from creamy white to browns and tans. At the shoreline is a couple enjoying the ocean view from the beach. This is another new watercolor with a beach theme. Send along a comment or question about how to purchase this original watercolor. Thanks!